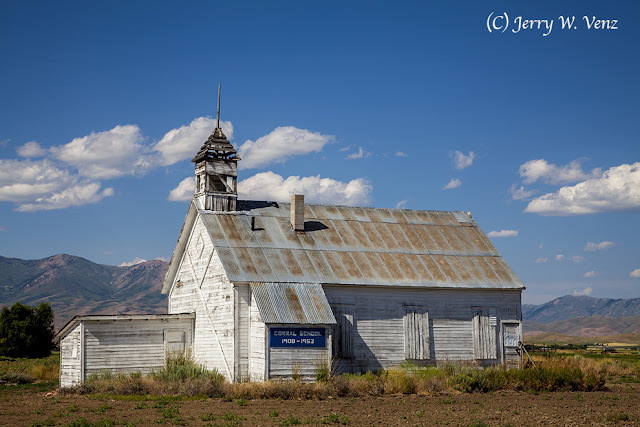 On our way to a funeral in Hailey, Idaho we passed by what looked like an old church in the little town of Corral, on the Camas Prairie, off of Highway 20. I noted it, but didn’t stop because the light in the late morning was not great relative to the building; in addition there were no clouds. However, on our way back we hit that area at about 5pm. So, I stopped for a few minutes to see what I could get in that light. I discovered that this was an old school; the sign on the building indicating its operation from 1908 to 1953. What caught my eye was the old bell tower and the cross pattern with the diamond feature on that end of the building. 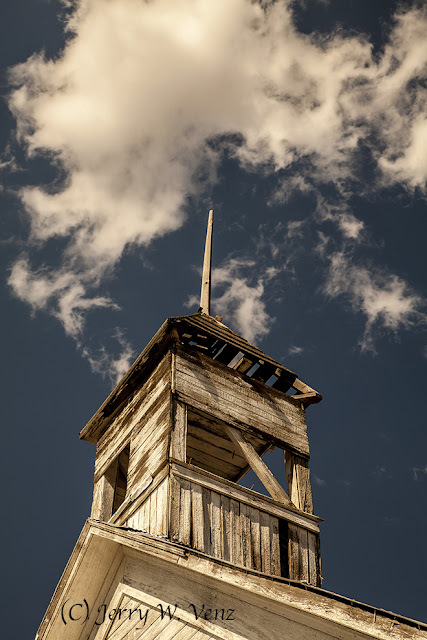 I wanted to really enhance that old wood and the clouds so, I used NIK’s, HDR Efex Pro 2, single image tone mapping using my version of their “late summer” preset. Here’s the master shot of the school at 5pm. 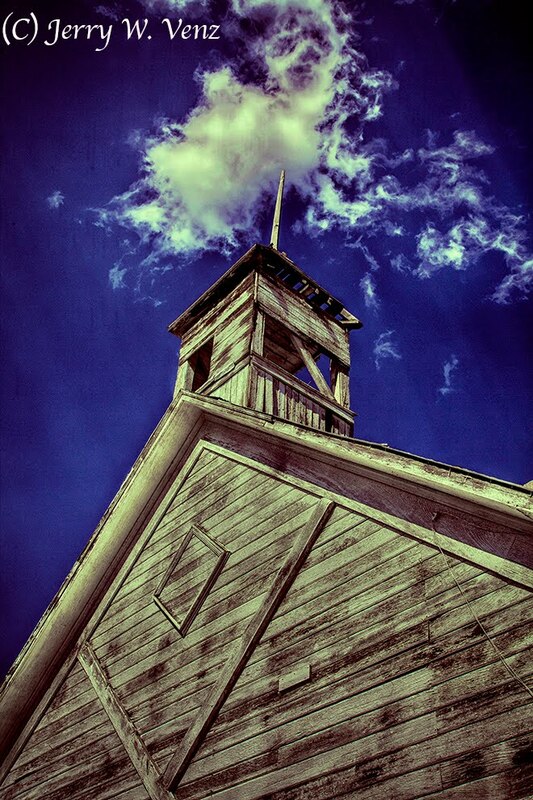 In the morning there was no light on the bell tower side of the school; it was all in shadow. Now we have nice hard light (for hard, textured, subjects I like a hard light) where earlier with it in shadow the light was too soft, which eliminates shadows and texture. In addition, now we have some clouds in the sky; I prefer clouds to an empty sky. You’ve gotta do this kind of subject in B&W as well! 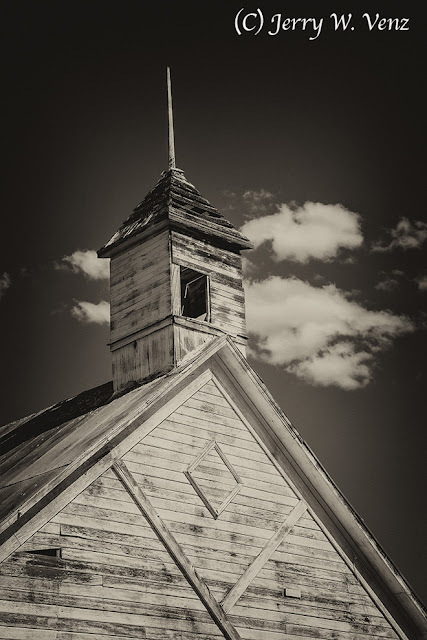 I converted my RAW color image to B&W using NIK’s Silver Efex Pro2, using their Antique Plate 1 preset. A nice traditional B&W presentation for this subject. I really like this up angle with the “cloud piercer” look of that bell towers spike! The crossing, directional, light on the bell tower is picking up lots of detail in those old boards as well. All told I spent 6 minutes taking the set of images and covered three angles, The wide view and the close-in crops before the wind blew away the clouds! Done. Well almost—I spent a Lot more time in post doing these creative versions you see here!